May | 2015 | The Fantastic Flame On! 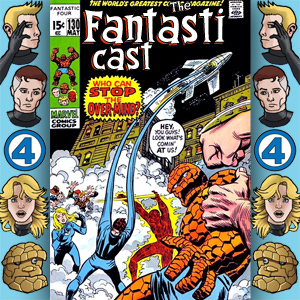 The Fantasticast Episode 130: Fantastic Four #114 – But Who Shall Stop The Over-Mind? 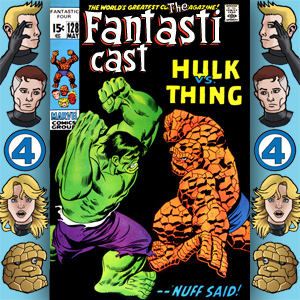 This week, Steve and Andy are sitting down to take a detailed look at Fantastic Four #114, featuring continuity, the Over-Mind, an angry dog, the return of Agatha’s resting cloud-face, and awkwardly-timed flashbacks. We’re also casting our eye over Avengers #92, where The Thing proves himself a totally credible witness for the defence. As well as this, we’re puzzling over the pagination, finding out what happens when Midnight Cowboy meets a Fourth World rip-off, laughing at lacklustre Yancy Street pranks, discovering the unlikely location of the secret of perpetual motion, and counting the notches on the one bedpost in the Marvel Universe you don’t ever want to count notches on! As I’m going through this story, I’m finding that I have absolutely no recollection of it. I don’t remember the asbestos-lined caravan. I have no memory of the special shower which dries Johnny out by blasting him with steam. This story feels completely new to me. 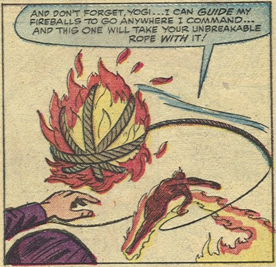 Sadly, this also means that I don’t remember this moment where Johnny uses an asbestos rope – the same rope which previously caused his flame to die out instantly – to grapple one of his fireballs and… er… hurl it at one of the Terrible Trio. Quite why he needs to do this when he’s previously been able to control his fireballs with an unlikely degree of accuracy is truly beyond me. 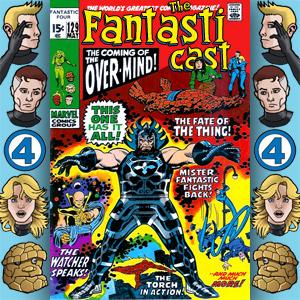 The Fantasticast 129: Fantastic Four #113 – The Power Of — The Over-Mind! The Thing – dead. The Hulk – missing. 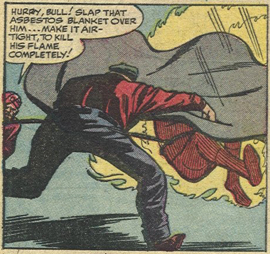 The Human Torch – angry. Mr Fantastic – prostrate. The Invisible Woman – inconsequential. The Over-Mind – Fourth World-ish. Stan Lee – not paying attention. Steve’s microphone – faulty. This week on the show, we’re celebrating the 100th issue anniversary of the first meeting of Marvel’s mightiest titans. Back in Fantastic Four #12, the Hulk and the Thing fought for the first time, and today, in Fantastic Four #112, the Incredible and the Ever-Lovin’ do battle once again. This is the biggest fight between the two to date, and there’s no pesky, meddling Avengers to spoil the fun and steal the thunder. 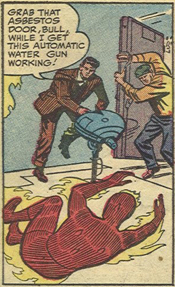 As only Stan Lee, John Buscema and Joe Sinnott could present.